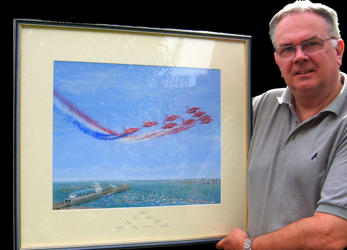 I have completed commissions depicting aircraft of all ages, from First-World war Sopwith Camels in sepia-effect finish, through the 20s & 30s era of long-range flying boats to WW2 military aircraft, first generation jets to Concorde and modern jet airliners and the Red Arrows (Most of my various Red Arrows paintings have been sold to raise considerable sums for local charities and 10 different prints have been presented to the Team across the years). Usually completed in acrylic, or other media if specified. 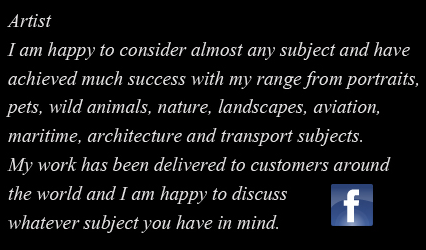 A selection of my aviation art is available from me as blank Greetings Cards.